Are you a devoted reader who likes talking about books with friends? If so, you may be a perfect candidate for a book club. 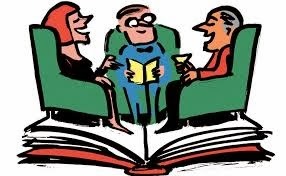 Book clubs are book discussion groups and they are quite popular in the U.S. Being a member offers the opportunity to share and discuss good books, learn about new books, express your thoughts, and socialize. Book clubs are small, informal reading groups that assemble monthly to discuss opinions, likes, and dislikes about a selected book. The group decides on one book to read for that month, with members bringing their suggestions. 1. What kind of book club? First, decide on the purpose of your group. Highly social? Seriously academic? This helps in knowing whom to invite and what books to read. 2. What kind of books? Think in terms of genre and level of difficulty. Groups of 8 to 16 members are best, enough for a discussion if several are absent, but not too many to make discussions difficult to manage. 4. Meeting — how often and when? The most important thing is to pick a schedule. Meeting once a month seems to be the most common. Homes, clubhouses, public libraries, churches, coffee houses, cafes and restaurants all make good meeting places. Of course, but nothing fancy. 7. What should we call ourselves? Give your club an identity. Here are some real book club names: Cool Girls Read; Chapter Chat; Wine, Chocolate, and Books. You can be creative or basic. Reading opens our world and sharing that world in a book club is a rewarding social activity.